How was it? Did you do it? You know. Christmas? Did you partake? If you didn’t. Congratulations, you’re definitely about 5 kilos lighter than me right now and I imagine your bank balance is looking a little healthier than mine. If you did, Merry Christmas, well done, take a deep breath, it’s over. 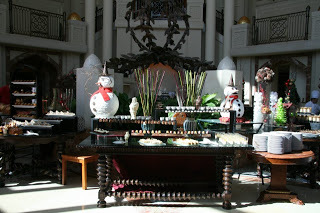 We went to the Four Seasons in Doha this year and it was absolutely gorgeous. It wasn’t just the food, the location and the people, it was the whole deal. Going to a hotel for Christmas can be dodgy, you’re missing the “home cooked” thing, the coziness of it all. There’s nothing quite as sterile as sitting in a vacuous room looking at hundreds of other families doing exactly what you’re doing – it’s like Valentines day for families, without the bonking. I don’t usually mention our locations and please don’t think this is any way a sponsored post, but I wanted to give the Four Seasons credit, because they made my day. The Little Travelers bounced between the buffet and the bouncy castle. 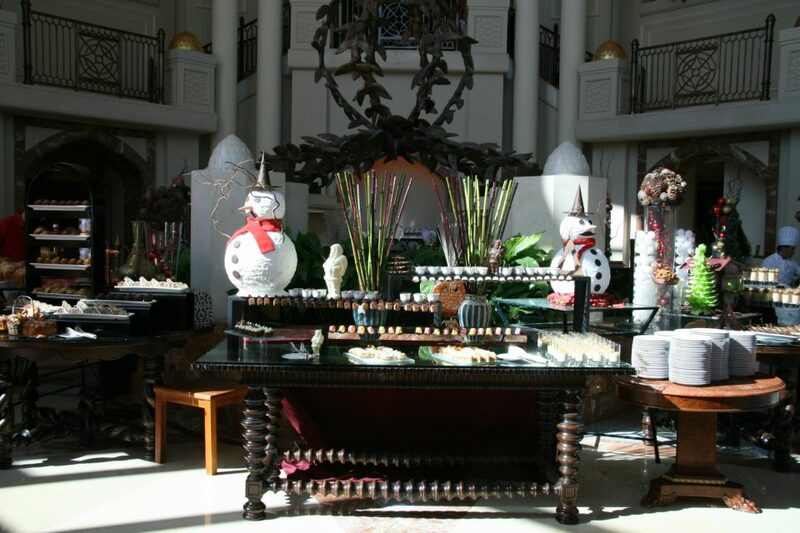 There was Santa, toys, activities, beach, pools and grass to run on – and the fourth traveler tells me he visited the chocolate fountain roughly 23 times. I know how he feels, I lost count with the champagne after the 124th glass. We spent the morning at home, watching the Little Travelers open their presents and speaking to family on Skype, but it all felt a little empty. Presents were opened too quickly, the Skype went in and out and I could feel an attack of the mopes coming. From the moment we arrived at the hotel the world was good again. It felt like, well, it felt like Christmas. I watched peoples faces as they wished each other a Merry Christmas, I saw friends introduce their parents who had traveled across the world to be with them, I met sisters and Grandparents. I marveled over ice carvings, parmesan blocks and chocolate snowflakes. It was seriously posh, seriously special and seriously good fun. It was so far from normal it became an event. Someone said “it feels like a wedding, but without the speeches” a fellow Aussie said “it feels like cup day” and a girlfriend’s father said “it’s just bloody marvelous” and I looked out over the Arabian Gulf as the sun was setting and agreed. In the lead up to Christmas I got a bit lost in the madness. I wanted to say thank you, I wanted to wish you a Happy Holiday, I wanted to find Polly Pockets – none of these things eventuated. I’ll be back again tomorrow, I’ve got lots of news (I’m going away, on my own, without a husband – I KNOW!) but until tomorrow – thank you. Thank you for coming back and seeing me here, thank you for voting for the blog and thank you for making me feel like you’re here with me on my travels.